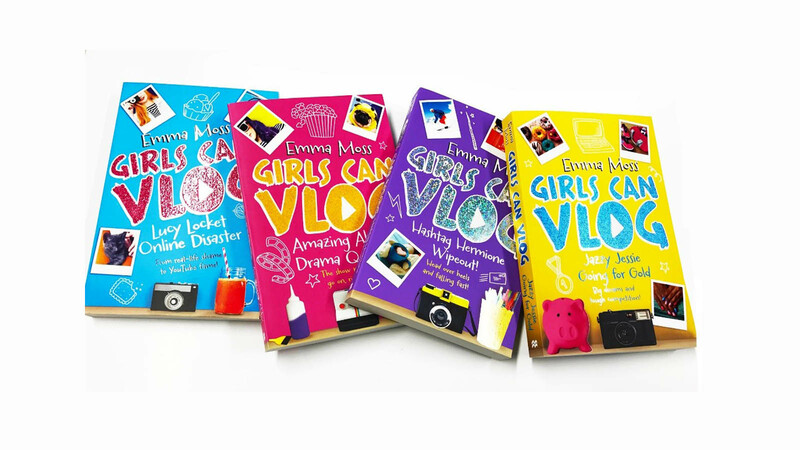 Discover your new favourite read this summer, Girls Can Vlog by Emma Moss. Discover your new favourite read, Girls Can Vlog by Emma Moss. You like stories about friendships, family and fun! Girls Can Vlog is the perfect series if you can’t get enough of discovering new YouTubers, whipping out your camera during the summer hols or heading to the latest convention featuring your favourite video hero. Intrigued? Your one-stop guide to the series is below…. NEWSFLASH . . . VLOGGING IS GO! It's bad enough having to move house, school and country all at the same time, without making a fool of yourself on the first day of term. But that's just what Lucy's done - and one of her classmates has videoed the whole thing and put it online! Lucy's so stressed, her stammer's become worse than ever. So when a friend encourages her to create her own videos, she thinks it's a terrible idea - surely she's embarrassed herself enough for one lifetime! Ever since Abby and her friends set up the Girls Can Vlog YouTube channel, Abby has been busier than ever. Not only is she vlogging at least once a week, but she also has a role in the school musical production of Grease. While Abby's always found keeping up with her schoolwork tough, now it's virtually impossible, and to make things even worse, she's developing a major crush . . . on two different boys! If Abby's parents find out about her slipping grades, will it mean the end for her acting and vlogging dreams?